Handy Art® Tempera, Washable Tempera, Acrylic and Face Paint Jar Sets are great for paint parties, events and school projects! Offered in sets of 6 - .75oz jars. Box includes English and Spanish copy. 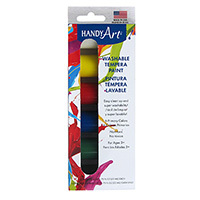 Handy Art® Tempera Paint Jar Sets offer excellent opacity and coverage and are great for posters. For ages 5 and up. Water based and Certified AP Non-Toxic. Handy Art® Washable Tempera Paint Jar Sets offer super washablity and easy clean up and are great for art, craft and school projects. For ages 3 and up. Water based and Certified AP Non-Toxic. Handy Art® Acrylic Paint Jar Sets offer pigment rich colors that are permanent and water resistant when dry and are great for crafts. For ages 5 and up. Water based and Certified AP Non-Toxic. 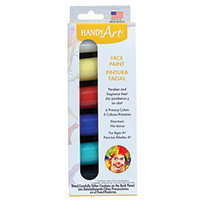 Handy Art® Face Paint is specially formulated to be paraben free and fragrance free! Creamy and bright opaque colors are great for parties, team colors, events and holidays. Paint washes up with soap and warm water and is safe for use as body paint. For ages 4 and up. Adult supervision recommended. Gluten-free. Water based and Conforms to ASTM D 4236.